Faitron is set to start pilot projects with two leading European retailers by the end of this calendar year. These major retailers are interested in HeatsBox overall along with the concept of disposable inner dishes, which can be directly placed into the HeatsBox. These disposable containers could contain prepackaged meals and could be sold in super markets. 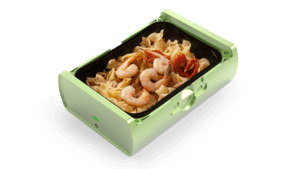 Healthy lifestyles are a growing trend and HeatsBox along with potential prepackaged inner dishes supports this. This creates a new level of convenience due to a food ecosystem based around HeatsBox. In conjunction with these pilot projects, Faitron will be cohosting a tour with the retail companies. This tour will consist of ten public events set to take place on university campuses in Europe. The purpose of these events is to provide product demonstrations in order to highlight the disposable inner dishes. Furthermore, weekly tests will be conducted with groups of students, office workers, construction workers, gardeners and commuters in cars. These tests are designed to determine the practical application and durability of HeatsBox. Additionally, the retailers plan to hold private panels to assess public opinion and evaluate product strengths throughout the pilot run. Faitron is thankful for the many advantages that come with pilot projects, such as increased speed in making the product market ready. Be sure to check back on our website and social media for more updates on our upcoming pilot runs!